Below are the on premise market leading and top CRM software systems and suppliers that should be put on the vendor short list for any enterprise software selection project. With the $5.85 billion acquisition of Siebel Systems, Oracle acquired its way into a top CRM software vendor position. Combined with the PeopleSoft acquisition and its CRM solution, Oracle's Customer Relationship Management (CRM) software is the global leader and supports over 20 industries with vertical market software solutions. While analyst rankings and market share statistics are not all completely in alignment, several recognized authorities put Oracle Siebel as the number one CRM software market share leader. Analyst firm IDC reports that Oracle Siebel CRM is the market share leader in the CRM software categories of sales force automation (SFA), marketing and customer service. Within the transactional CRM applications market, Oracle was ranked the number 1 vendor with a 15.6% market share. IDC states that Oracle's stronghold is in Sales Force Automation where the vendor holds the number one position with $587M revenues and 17.9% market share. 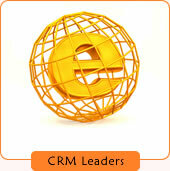 Research firm Datamonitor also names Oracle CRM the decisive leader in the CRM software market. According to the Datamonitor, Decision Matrix, "Oracle's CRM products, and particularly Oracle Siebel CRM, are among the leading solutions in almost every aspect of CRM technology, comprehensively outpacing all other competitors." In Gartner's vendor rankings, the analyst firm places Oracle Siebel CRM in the Magic Quadrant's for Multichannel Campaign Management, CRM Customer Service Contact Centers, Customer Data Integration Hubs, Field Service Management and Sales Force Automation (SFA). Oracle's Siebel CRM is a software leader in the Forrester Enterprise CRM Wave and the company is rated as a leader in 11 Forrester Wave reports. Particular emphasis seems to be given to the Siebel financial services edition, where Oracle's Siebel has been rated as having the strongest current offering in the Forrester Wave Evaluation: Enterprise CRM Suites for Financial Services. Forrester reviewed strengths and weaknesses of several CRM software systems across 464 criteria in the three areas of current offering, strategy and market presence. According to the vendor summary cited in the report, "Through years of experience, the Siebel CRM product has developed in such a way that it routinely provides critical but undervalued functionality. It is one of the few products in this evaluation to offer strong field campaign management to accommodate bank branches, insurance agent offices and investment broker offices." While a clear market leader, Oracle CRM is not without its risks nor above market competition. Beginning with Siebel 7.7 and continuing to Siebel 7.8, 8.0, Siebel 8.1 and beyond, Oracle is integrating and certifying components of Oracle Fusion Middleware in order to integrate the acquired Siebel product (and other acquired products) into a more structured Oracle framework. The inherit risks of this project are significant and may impact the maintenance and upgrade path for any current or potential customer. Similarly, and quite comparable to primary competitor SAP CRM, the CRM software solutions offer a broad range of functionality, feature sets, administrative tools and industry-specific capabilities which provide the basis for complete business applications as well as the inherit issues of lengthy time-to-value, a lack of flexibility in modifying business processes, implementation project failure risk, and higher implementation and ongoing costs. CRM forecast's Jim Belleau is consolidating, synthesizing and making sense of the competing claims in an attempt to publish an apples to apples comparison between Oracle Siebel CRM and SAP CRM. We expect to publish his analysis on this page in the near future. In the interim, see the Oracle CRM system review. Not content to leave arch rival Oracle in a sole leadership role, competitor SAP also claims the top CRM software system and references independent support from Gartner Dataquest which suggests that SAP is the worldwide software market share leader for CRM, ERP (Enterprise Resource Planning) and SCM (Supply Chain Management) business management applications. Founded in 1972 in Walldorf, Germany, SAP has emerged to become the world's biggest business application software company. SAP's ERP application is used to integrate enterprise-wide business functions such as accounting, distribution, supply chain, human resources/payroll, manufacturing and customer relationship management (CRM). SAP touts more than 36,000 enterprise company customers in over 120 countries. SAP isn't known for deployment of individual line of business applications such as CRM software, accounting software or distribution software. However, SAP has become infamous for enterprise-wide ERP systems deployment, that is, being the central ERP system for all line of business applications across the enterprise. With such a grand application software scope, SAP implementations are not for the faint of heart. As well stated in a 2008 AMR Research report authored by analyst Jim Shepherd, " ... this is typically a multiyear, multimillion-dollar effort to transform the business." The SAP Business Suite stands alone as the ERP software flagship product that is responsible for nearly all company revenue. Business Suite includes the primary enterprise software components of ERP, CRM, product life cycle management and other related business software components. Business Suite has a maintenance cycle until 2013. It remains unclear whether SAP will continue Business Suite beyond 2013 or will introduce a new product replacement. For additional information, see the SAP system review. While not the top CRM software system, Onyx supports more than 1,450 middle market and enterprise customers in about 50 countries. While Onyx is largely known for its horizontal customer relationship management software suite, it has done well in SFA software reviews and it also provides vertical market editions for the financial services, health care, call center, high-tech, professional services and government CRM or public sector industries. The company's target market includes the Fortune 2000 or the Global 5000 and key customers include Amway Corporation, Mellon Financial, Regence Group, and State Street Corporation. Originally based in Kirkland, Washington, the company was founded in 1994, went public in 1999 and after failing to advance in the public markets was acquired by Made2Manage (M2M) in 2006. Made2Manage later changed its name to Consona, and in 2012, a merger between Consona and CDC Software created Aptean. Onyx technology was originally born from the Visual Basic, fat client, client/server era, however, over the years has slowly but steadily evolved to a thinner client, (although not a zero footprint), .NET based and SOA (service oriented architecture). The XML web services and multiple-tier, component-based architecture provides significant scalability for enterprise customers as well as custom business rules and workflow to accommodate challenging business process cycles. Onyx takes a unique building block approach to delivering integrated CRM software modules. Unlike traditional CRM software solutions that deliver line of business software modules based on the needs of specific departments (e.g. sales force automation (SFA), marketing automation, customer service and support), Onyx CRM includes just three process oriented applications, each spanning a diverse range of divisions, tasks, and functions. These three individually-purchased software modules – customer management, process management, and performance management – are intended to integrate disparate and sometimes disjointed activities across sales, marketing, service, and call centers and in the end enable faster and more reliable execution of customer-facing business processes. For additional information, see the Onyx CRM review. The CRM software analysts do not achieve consensus when it comes to determining the top CRM software market share leader. They actually don't even agree on how many vendors make up the top vendors list. In a recent Forrester Wave report, the analyst firm separates the CRM software market into the three categories of enterprise CRM suites, midmarket CRM suites and CRM specialty suppliers. In the enterprise segment, Forrester evaluated 13 CRM software systems. Oracle's Siebel and SAP rose to the top, however, there were plenty of other CRM systems Forrester considered strong contenders, including Infor CRM, Epiphany, Microsoft Dynamics CRM, Onyx CRM, Oracle's E-Business Suite CRM, PeopleSoft CRM and RightNow. According to Bill Band, principal analyst and a co-author of the report, "The CRM market has been in a lot of turmoil ... Some may say [Siebel and SAP] are the only two vendors people think about. But that's not really the case. There's a wide range of other players out there." "The market has settled down, but there are still lots of changes," Band said. Enterprise CRM software vendors like SAP and Oracle are trying to move down market to capture a share of the small and midsize business market while traditional midmarket firms are moving upstream and finding success selling to enterprise customers. "It was a bit of a surprise to us that some of the midmarket suite vendors have become credible for the enterprise market," Band said. "They're definitely a legitimate option, where they may not have been two years ago."